Erskine Nicol was born in Leith, Scotland, and overcoming fierce opposition from his parents to be an artist, he took all opportunities to become an artist, taking an apprenticeship under a decorative house painter then aged 12 becoming a student at the Trustees’ Academy in Edinburgh. 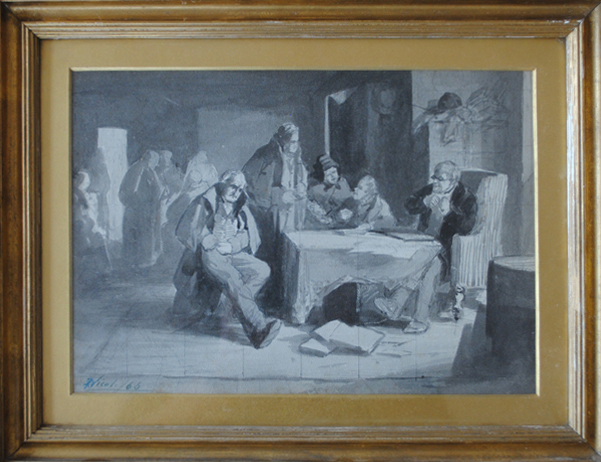 He spent some time back in Leith as a drawing instructor at a local school was followed by four years in Ireland (from 1846) as a teacher and portrait painter, painting humorous character studies and genre scenes of the Irish working classes. These won him a high degree of popularity, though today the idea of the Irish as mirthful country bumpkins would not be seen as in good taste. 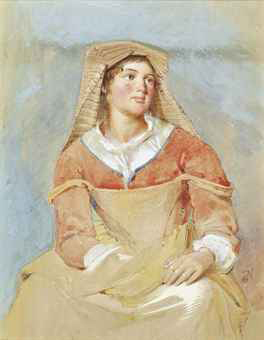 Back in Scotland, in 1851 he exhibited a half dozen such works at the Royal Scottish Academy, followed many others. He became RSA in 1859 and went to live in London in 1862 (though making yearly trips to Ireland), and was elected ARA in 1868. He retired from the Academy in 1885, and went back to Scotland, and later on to Feltham in Middlesex. Nicol’s painting The Emigrants (1864), showing a poor couple waiting in a railway station, is in the Tate Britain, and is one of the original works in Henry Tate’s collection.